When it comes to selecting a restaurant, our pickiness tends to be proportional to our level of hunger. That’s often how we end up at a drive-thru looking for a quick fix, rather than at a better-quality sit-down joint. Similarly, the amount of research we tend to put into finding a loan seems to vary inversely with how quickly we need that funding. When you’re in need of same-day funding, for example, you tend to look for the fastest lender — not necessarily the best one. But while bad fast food may just give you indigestion, a bad loan can have far worse results. Not only can you find yourself stuck paying hundreds in extra fees, but you may also end up making a bad credit situation worse. Instead of rushing into the first loan you find, here are a few steps to help find a better same-day loan. Although installment loans aren’t generally as quick to pay out as short-term loans, many borrowers can receive funding in as little as one business day with the right lender. And that little bit of patience can end up saving you big. That’s because personal installment loans are often significantly less expensive than short-term cash advance loans, with APRs that max out at 35.99%. Our top-rated online lending networks can help qualified borrowers obtain loans of up to $35,000. In addition to having much more reasonable APRs, installment loans can also be more affordable to repay thanks to the fact that you can take longer and make smaller payments than with a short-term cash advance loan. Short-term loans are repaid all at once, principal and fees included, which can be a hefty sum. Installment loans, on the other hand, are repaid in regular installments, typically monthly payments, over a period of six months up to six years. This structure means that longer loan terms come with smaller monthly payments, making it easier to find a monthly payment you can afford. That said, remember that the longer you take to repay the loan, the more it will cost overall thanks to the additional interest fees. In the event you simply can’t wait for an installment loan to disperse (or are unable to qualify for one) short-term loans can be better than no loan at all — but only if you’re certain you can repay the loan and fees on time. If you’re committed to finding a short-term loan, a good option is often to use an online lending network, like our expert-rated options below. Online lending networks can connect you with dozens of potential lenders, making it easy to compare fees to find an offer you can afford. It’s important to note that online lending networks are not actually lenders themselves. Online lending networks are only intermediaries that connect their lending partners with potential borrowers. Once you select an offer shown to you by the lending network, you’ll be taken to the lender’s website to complete the loan process. It’s the individual lender, not the network, that will fund your loan and the lender to which you will need to make payments. Alright, so few of us read every line of every agreement we sign, even the financial ones. That’s fine — you don’t need to read every line. However, you do need to read the important lines, no matter how much of a hurry you’re in. This includes paying attention to how much you need to repay, when you need to repay it, and any potential snags you may hit along the way. With installment loans, for example, you’ll want to know the amount of your monthly payment, the due date for that payment, and how many installments you’ll need to make to repay the full amount. You should also note the APR, the origination fee, and any other processing fees you may be charged. Additionally, you should see if there are any prepayment clauses that could hit you with an expensive fee if you pay off your loan early. Short-term loans are a little different. These loans are generally repaid all at once, with all fees included on the one due date. So, be sure to note the exact day your full repayment is due, as well how much the loan is actually going to cost. 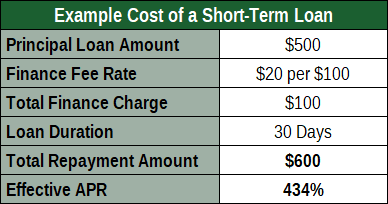 Unlike most consumer credit products, short-term cash advance loans don’t generally use APRs to calculate interest fees (though they do have to provide the APR for reference). Instead, these loans usually come with finance charges based on the size of the loan. For example, a typical short-term cash advance loan could have a finance charge of $20 per every $100 borrowed. This would mean that you’d be charged $100 in finance fees for a $500 loan, and the total $600 in principal and fees would be due all at once on the same single due date. Although loans are often the go-to for quick cash, you may not actually need a loan to meet your needs. Most expenses these days can be put on a credit card, and even subprime credit cards can be more affordable than costly short-term loans. What’s more, the interest-fee grace period offered by most credit cards means you can have at least 21 days from your billing date to pay your balance in full before you’ll be charged interest. You can get approved for many of our top-rated cards in just minutes online and get your card in days. For those cases in which cash is really a necessity, most credit cards can be used to make cash withdrawals from an ATM, but you should be aware of the costs, including the fees and extra interest. Specifically, credit cards tend to charge fairly steep cash advance fees — often 3% to 5% of the transaction — for every cash advance. Additionally, credit card cash advances don’t qualify for the interest-free grace period, meaning the cash advance transaction will start accruing interest as soon as it hits your account. At the same time, a credit card cash advance can wind up being more affordable than a short-term cash advance loan in some cases. For example, a $500 credit card cash advance with a 5% fee and 35% APR that is repaid in two months will cost around $55 in fees, potentially half of a pricey short-term loan. As with many things in life, the right preparation can make a big difference when it comes to ensuring the loan process goes off without a hitch. A little bit of research to ensure you have all the necessary information — and that it’s 100% accurate — can make for a quicker turnaround time on your loan. In other words, you can often get your funds faster if the lender doesn’t need to follow up for more details or to verify any data. When hunger strikes, it can be hard to take time to research your options before finding a meal. But those few minutes of checking online reviews could be all the difference between a great meal — and a bad night. And the same applies to finding a good loan; while you may need to find funding in a jiffy, taking even a few minutes to follow the steps necessary to get a good loan can make all the difference when the time comes to repay that loan.